F had sent us a link to a byob sushi place weeks ago, and we finally were able to make plans to check it out. 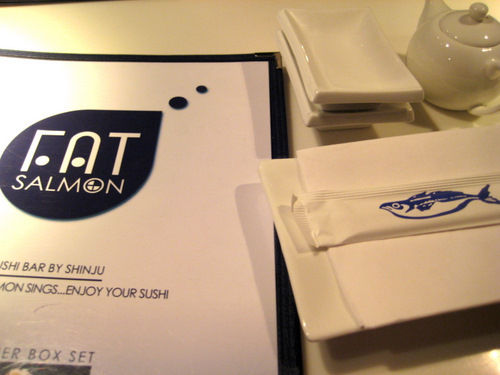 A fairly newish spot, open since February, Fat Salmon is a sleek and modern place in Washington Square. The decor actually reminds me of Morimoto’s a bit, probably due to the waviness in some of the design elements. All of the furnishings are clean and white. On a weekday evening, the place was pretty packed. Since it was a byob, M brought along a japanese cocktail concoction. It was delicious and strong and had me at first sip. I love the standard green salad with the ginger dressing that is offered by pretty much any and every sushi restaurant. But not all of the ginger dressings are up to par. I’m happy to say that the green salad here was one of the best. There’s even cucumber and green bell pepper slices and the dressing is zesty and amazing. And it’s a good sized salad. 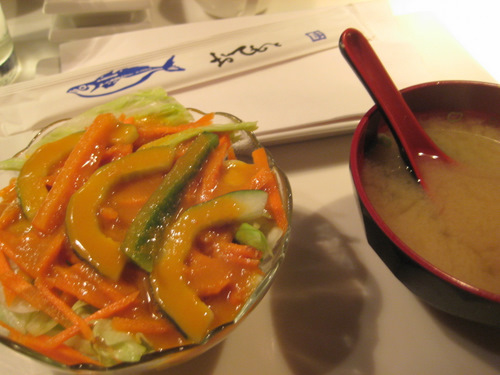 The miso soup is perfectly nice as well. On the right, that slop of mess, is the Rolling Fire. 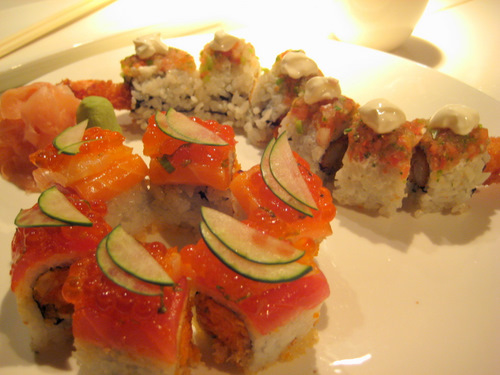 It is a roll with shrimp tempura and cucumber, topped with broiled spicy scallop sauce and some imitation crab meat. And oh, it’s like totally spicy. Man, it surprised me. You can see that it’s sort of sitting in a red pool of firey oil. It’s still good, but it is quite the shocker. So be careful! On the left is Mr. Shiro, one of my favorites of the evening. 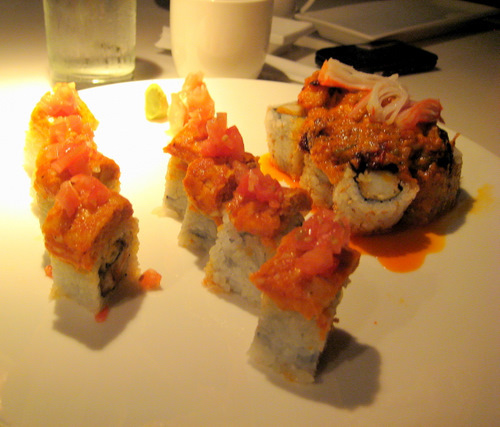 It is eel tempura, avocado, crunch w/spicy sauce on the inside, topped with broiled spicy white tuna and tomato. Here is the Dragonfly Roll, which actually does look like a dragon. 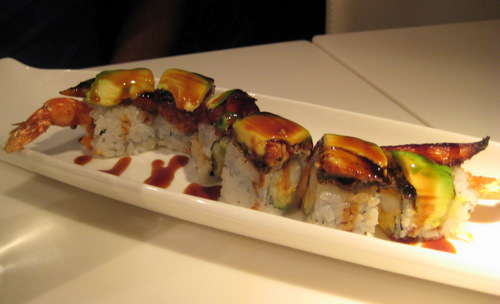 It has shrimp tempura, cucumber, and spicy sauce on the inside, and is topped with eel, avocado, and eel sauce. There’s nothing about this roll that anyone could dislike. It’s great. On top is the White Forest, my absolute favorite roll of the evening. It was shrimp tempura on the inside with spicy sauce (you could also get salmon tempura), topped with a heap of pico de gallo and our cream. It was like a sushi salsa roll, and I absolutely went crazy for it. On the bottom is the Lost Rainbow, with spicy crab stick, scallion, and masago on the inside, topped with tuna, salmon, white fish, ikura in sesame soy sauce, and cucumber. This would have been really good, but the ikura on top was super salty and it kind of ruined it for me. It overpowered everything when it could have been a nice compliment. So it turned out to be my least favorite roll of the evening. All in all, this was great food with great friends. Fat Salmon is a nice find. Their main thing seems to be crazy rolls. Their menu had dozens. So if you like a great variety of special rolls, then this is the place for you!